This is a relative of the spice ginger and its common name is Indonesian wax ginger. 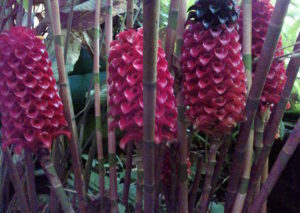 This name describes the beautiful, glossy, sealing wax-red, pineapple-like inflorescence which contains many individual flowers. Like all gingers, the foliage is taller than the flower spike; the leaves and stems can attain a height of 2 to 3m, whereas the flower spike is only 30 to 60 cm or so. This can be seen at its best in our Tropical house now.